the canDIshhh tales: Letter of the Month! I was shocked to see portions of my letter printed out on the Letter of the Month section of this month's OK! Magazine. I was told thru email that I should watch out for the March 2006 issue, but I was merely expecting to see more of Brangelina, and indeed the cover featured the now public Brangelina. Carefully reading and turning EVERY page, I was astonished to see MY name! My name?! (Can you believe it??!!) On the magazine!! 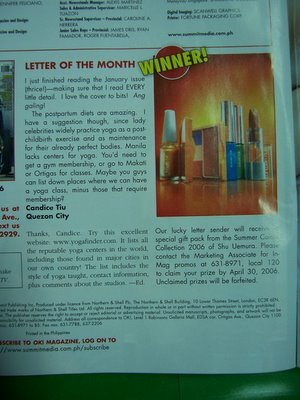 My email was chosen as Letter of the Month! And not only that, I won a great great great prize!! My ultimate favorite make-up brand!! Shu Uemura!!!! Yeah baby!!! Until now, I'm still reeling from the shock - thanks to OK! Magazine, Frances Amper and of course.. Brangelina!!!!!! !